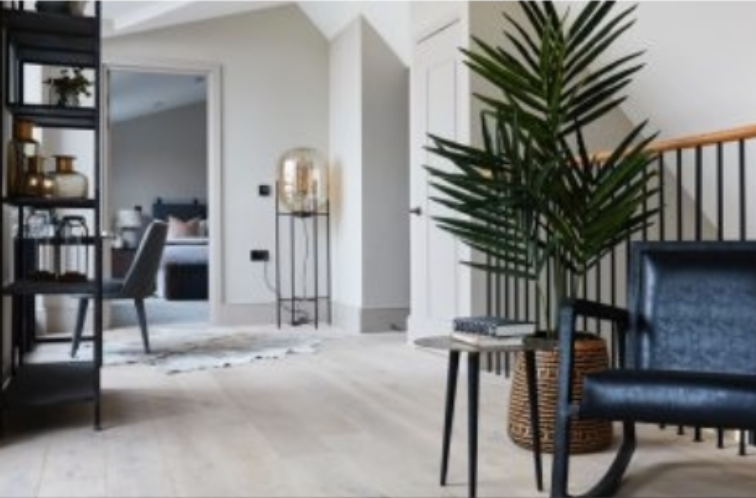 Burbeck Interiors were approached by the developers of ‘The Set’ , an exciting development transforming a former film studio into a mix of duplexes and apartments in the heart of Battersea, London, to create a completely unique show home with real individuality and flair. The design team kept the building’s strong architectural design and heritage at the forefront of the creative process, designing a bespoke interior scheme to perfectly complement the historic character of the development. Burbeck achieved this using considered design techniques, fusing a mixture of materials, from industrial metals to rich velvets to reflect the juxtaposition of old and new. It was also important to acknowledge The Set’s studio history, with the team selecting artwork featuring artists who had previously used the property as a recording studio. The theatrical element came through the use of colour and textures, mixing unexpected pops of colour with fresh plants, thoughtful accessories and personal touches. The furniture selection for The Set was completely tailored to the space, as the unit was a split level 3 bedroom penthouse it was imperative to demonstrate how the living area space could be optimised, whilst also presenting a lifestyle befitting the apartment. This was executed in a variety of ways, from having the upholstery designed and made specifically for these rooms, to positioning the office desk on the top floor, facing out over the London skyline, demonstrating the unique aspect of the mezzanine level.